PDFtext - Dlls for your pdf-files... Royalty free! As 32- and 64-bit-version! 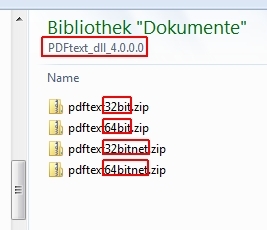 With this dlls you can get the complete text-content out of your pdf-files. To do this you can use three ways: As an automated text-export into a generated file. As clipboard-content. As a returning text-string. You can use it with delphi, vb(a), vbxxxx Express, C#, C, C++ and all main programming IDEs (.NET, too!). Please try it before you buy. With your app the libraries can be distributed without paying anymore... It's royalty free! Buy this dlls one time and distribute them as often as you want. 2 dlls in 1 package. 32- and 64 bit! With unicode support (utf8). Completely revised.